Sub-titled, “Why Biblical Christianity Makes Sense”, in this useful book Peter Bates sets out to present a clear apologetic for traditional, mainstream Christian belief. This is a rigorously reasoned, yet thoroughly readable, defence of the Christian faith from a thoroughly biblical viewpoint. What makes this book unusual is that Bates is not a theologian nor even a cleric. He is an 'ordinary' Christian who over 30 years has explored the Christian faith against the backdrop of a highly skeptical world. 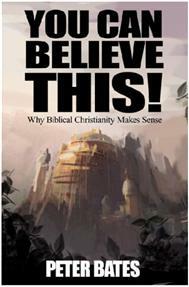 Articulate, yet down to earth, this book is a useful addition to the average Christian's library. It is also a book one could consider as a gift to a non-believer. Beginning with a discussion on the nature of 'truth', 'faith' and 'science', Peter Bates argues that God MUST exist, and that the only reliable source of information about Him is the Bible. Taking the Bible as the 'Word of God', Bates explains what it tells us about the creation of the world, the fall of man, the ministry of Jesus the Messiah, the purpose of the church, the end of the age - and much else besides. A lengthy bibliography points readers toward other useful resources, and gives an indication of the many positive influences on the author's own Christian experience. Filled with numerous anecdotes from the author's own life, this is an engaging book and one that many “ordinary” Christians will find helpful. We do not need to be “theologians” to defend our faith! “Ordinary” Christians who are looking for a reasoned defence of Christianity. Agnostics and even atheists might also benefit from its down to earth, common sense style and approach. Peter Bates came to faith in Christ at the age of 20 despite not having the benefit of an active Christian upbringing. He has experienced membership of a wide range of churches in the last 30+ years as a believer and now simply describes himself as 'a disciple of Jesus Christ'. He was born in Newcastle upon Tyne in the North-East of England and still lives in the area today.